When I went to New York City this summer, I met Miriam Mades from the company AlterKnit New York. As someone who believes in quality over quantity and knowing that leading a great life sometimes means a wardrobe gets damaged, I was thrilled to learn about this company. Like me, they believe in quality, and preserving it. From replacing the torn lining in a suit jacket to reweaving a Missoni sweater so one could never tell there was a snag, Miriam and her team do it all and with extreme care and pride in their work. 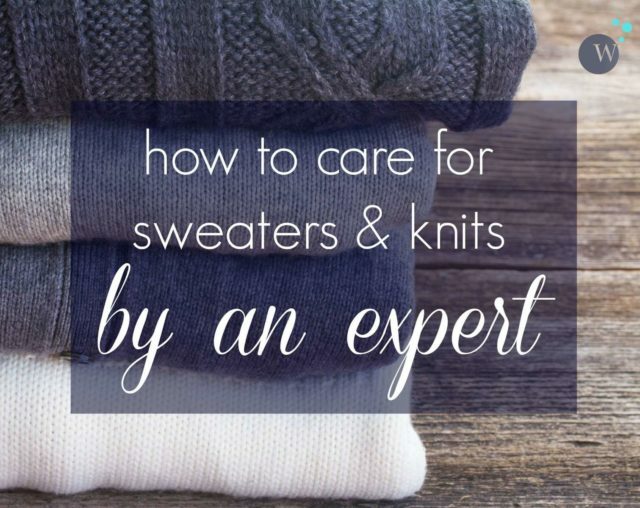 Many of you reach out to me asking how to care for certain garments; it made sense to get advice from the pros so I asked AlterKnit New York to share their tips on caring for knits. At AlterKnit New York, we take care of clothes every day coast to coast. After working on so many favorite pieces we have a lot of experience with damaged clothing. The most important thing we tell everyone is to CLEAN your clothes. Nothing is full proof but cleaning your clothes and then storing them properly, especially at the end of the season, will give you a good chance that your knits will remain hole free. You have choices when it comes to cleaning. Wash on delicate in your machine, hand wash in the sink or send them to your dry cleaner. But PLEASE clean them- your clothes will thank you. Do you wash everything by hand? No. Somethings are suited for washing exclusively by hand. Others fare well in the machine. Some stuff we only dry clean. For sweaters we like to encourage a mix of hand washing and dry cleaning. But again, as long as you a re cleaning we are happy! How should we store sweaters? Please don’t hang them in your closet. The shoulders will start to get out of shape due to the stress points caused by the hanger. Plus the weight of the fiber can also stretch out the body length. Just fold them like you would a t- shirt. If you need to remove any creases you can gently steam them out with the low setting on your iron. When the seasons change you can store them in a breathable sweater bag with some cedar blocks or sachets for extra good measure. We don’t like suffocating them in a plastic bin because we don’t have proof that this method works plus we can’t stand the smell that the bin leaves on the clothes. Any other knit wear tips? Get a fabric shaver. Removing pills will help your garments look new and also deter any proteins from lodging in the fibers—its the proteins that critters like moths and silverfish are attracted to. You need to be careful with a shaver. Use them on a true flat surface…i.e. yes you should use your ironing board. It might be a pain to drag it out but it will less of a pain then the hole you could make by shaving on an uneven surface. Finally, when you do a snag, pull or small hole…get it to us before the hole gets bigger. So many times we get huge costly repairs that could have been prevented if the garment had gotten to us sooner. At the end of the season double check all your knits for holes. If you see any holes sooner rather than later is the best time for repair by a professional. After fixing so many holes, we know that the sweater that gets sent to us in November most likely had the holes in July. We know nobody wants to see feel or touch their cashmere fisherman sweater in the hot summer days but getting a head start of refreshing your wardrobe before the autumn season arrives will be worth it. A note on fine knits. We work on very fine gauge knits as well. Fine gauge knits are more delicate and often holes start as a snag or pull…like you would get on a pair of pantyhose. Plus, when its is warm out we tend to take fine gauges with us to places where the temperature will fluctuate. Like a night out at the movies or eating in a restaurant. Its easy to get these caught on jewelry or other accessories. So be extra careful with them. If you get a pull don’t worry we are here for you! After meeting Miriam and learning more about AlterKnit New York, I know this to be a company I would trust with replacing the brittle lining in my dad's Korean War flight jacket, to repair my grandmother's baby blanket, or to take an expensive designer knit piece and make it look like new. AlterKnit New York takes their time, chooses the best method to ensure the piece looks as perfect as possible. They perform moth hole and snag repair, invisible mending, reweaving, heirloom restoration, restyling of pieces, alterations, and much more. See examples here. While they are based in New York, they have customers across the country and will provide you with a pre-addressed shipping label and maintain communication. I was so impressed with this company, I asked them to write this piece. I was not compensated for this post. Do you have the fabric shaver? if so, what do you think about it? I don’t have that exact one, but I got one many years ago that’s similar and use it all the time.